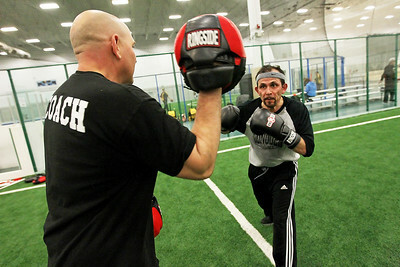 Candace H. Johnson-For Shaw Media Coach Larry Lentz works on drills with Joe Mancino, mayor of Hawthorn Woods, during Conquer Fight Club's boxing conditioning class at the Libertyville Sports Complex. Mancino will fight in the Conquer Fight Club's Badges vs. Bad Guys boxing event on May 5th at the Libertyville Sports Complex. 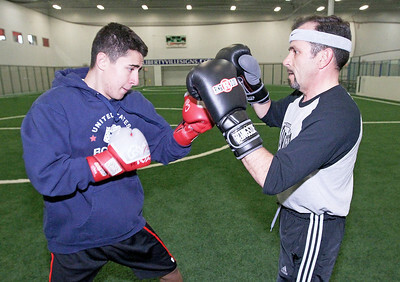 Candace H. Johnson-For Shaw Media Ruben Escobedo, 18, of Round Lake works on drills with Joe Mancino, mayor of Hawthorn Woods, during Conquer Fight Club's boxing conditioning class at the Libertyville Sports Complex. 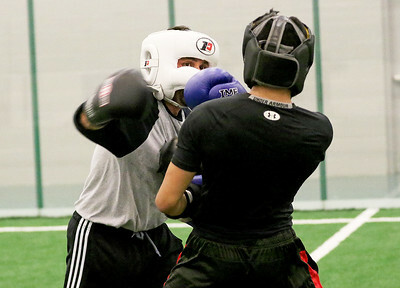 Candace H. Johnson-For Shaw Media Hawthorn Woods mayor Joe Mancino (left) spars with Michael Moss, 16, of Vernon Hills during a training session at the Conquer Fight Club in Libertyville. Both will fight in the Badges vs. Bad Guys boxing event on May 5th at the Libertyville Sports Complex. 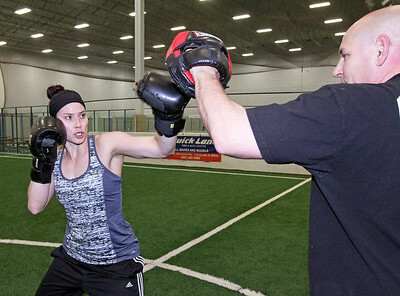 Candace H. Johnson-For Shaw Media Jenna Kuehl, 28, of Grayslake works on drills with Larry Lentz, head coach during a Conquer Fight Club's boxing conditioning class at the Libertyville Sports Complex. Kuehl will fight on May 5th in the Badges vs. Bad Guys boxing event. 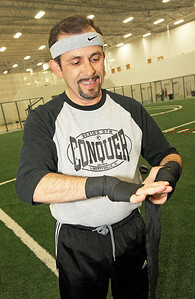 Candace H. Johnson-For Shaw Media Hawthorn Woods mayor Joe Mancino uses hand wrap to stabilize his hands before he puts on his boxing gloves to train for his first fight at the Conquer Fight Club in the Libertyville Sports Complex. 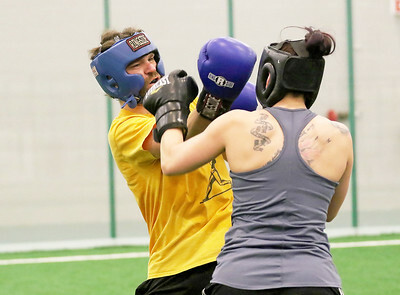 Candace H. Johnson-For Shaw Media Chris Kozak, of Libertyville spars with Jenna Kuehl, of Grayslake during a training session for the Conquer Fight Club's Badges vs. Bad Guys boxing event on May 5th. 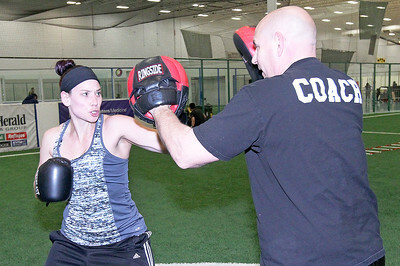 Candace H. Johnson-For Shaw Media Jenna Kuehl, 28, of Grayslake works with Larry Lentz, head coach, on drills during Conquer Fight Club's boxing conditioning class at the Libertyville Sports Complex. Kuehl will fight in the Badges vs. Bad Guys boxing event on May 5th at the Libertyville Sports Complex. Candace H. Johnson-For Shaw Media Chris Kozak, of Libertyville (left) works on drills with Elvyn Tino, of Vernon Hills during Conquer Fight Club's boxing conditioning class at the Libertyville Sports Complex. Candace H. Johnson-For Shaw Media Michael Moss, 16, gets some help doing crunches from Elvyn Tino, both of Vernon Hills during the Conquer Fight Club's boxing conditioning class at the Libertyville Sports Complex. 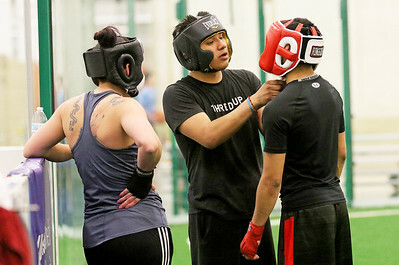 Candace H. Johnson-For Shaw Media Jenna Kuehl, (left) of Grayslake watches Elvyn Tino help Michael Moss, 16, both of Vernon Hills put on his head gear during Conquer Fight Club's boxing conditioning class at the Libertyville Sports Complex. 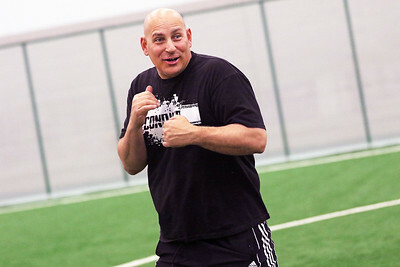 Candace H. Johnson-For Shaw Media Coach Larry Lentz talks to his boxers during the Conquer Fight Club's boxing conditioning class at the Libertyville Sports Complex. 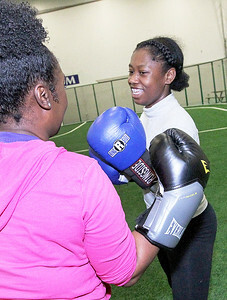 Candace H. Johnson-For Shaw Media Alicia Rogers, of Gurnee works on drills with her daughter, Daiya, 14, during the Conquer Fight Club's boxing and conditioning class at the Libertyville Sports Complex. 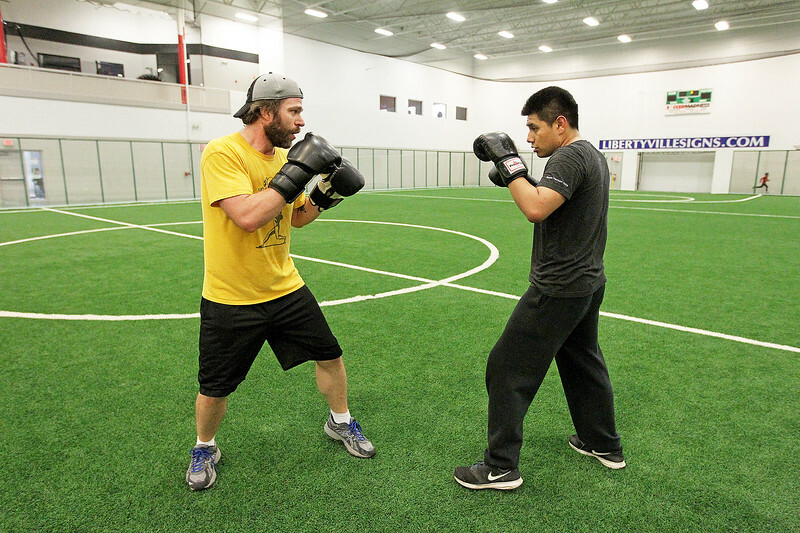 Chris Kozak, of Libertyville (left) works on drills with Elvyn Tino, of Vernon Hills during Conquer Fight Club's boxing conditioning class at the Libertyville Sports Complex.